Manatee munching on the growth on the dinghy dock at the Las Olas Municipal Marina. 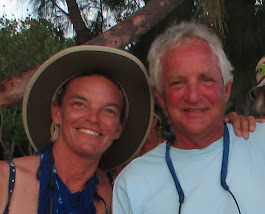 Believe it or not, we finally left Vero Beach on 22 March, 2013, 34 days after arriving. 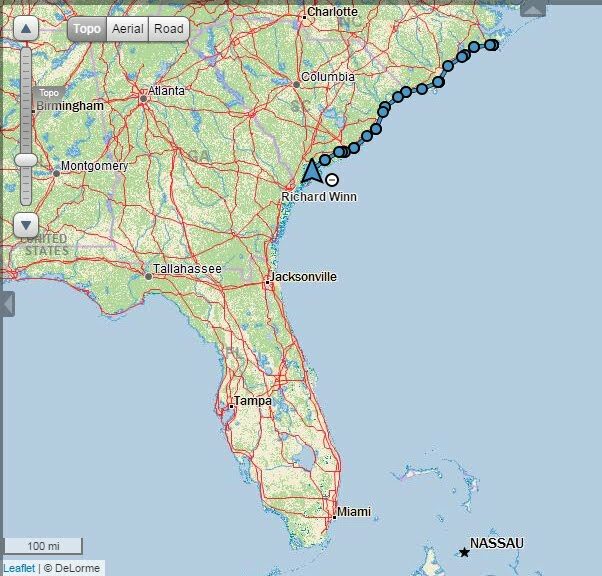 This was a significant passing; our trusted captain, Fred, had headed back to Beaufort, NC, and our cruising companions from Acadia would be not continuing with us on our southern travels. We were on our own. In many ways it was as terrifying as liberating. As we released the line from our mooring ball, we both could feel the anxiety and excitement boiling in our guts. We filled up the fuel and water supplies, and headed south. One of the more unusual obstacles on the ICW we encountered as we headed into Southern Florida. Yes, that is a house on a floating platform. We spent the first night at anchorage just outside of Steward, Fl, and the second night at anchorage at the north end of Lake Worth, FL. We started learning our way through the many low clearance bridges which encompass much of the Florida intracoastal waterway. These bridges all have clearances well below our mast height of ~58 feet, but do open as various forms of draw bridges. Most have a scheduled opening, often twice an hour. And if there are two or more bridges in a row, most have staggered openings, allowing for the average cruising boat to make it to the next bridge in the series in plenty of time before its opening. So, you say, what could be the big deal with passing through the multitude of bridges? Number one, we are beholden to the bridge operators. They are the gods of good passage, and if they decide to open the bridge after our request, we are in good fortune. If for some unknown reason we piss off the bridge operator, we are out of luck. We have to wait for a more likeable captain to request the opening and sneak through ‘unnoticed’. Or if only one arm opens from a double bascule bridge, understand that, “What you see is what you get!”. Number two, we often are not the average cruising boat able to make the next bridge in the series in plenty of time before its opening. We typically arrive 5 minutes AFTER the bridge has opened and CLOSED. So, you say, what could be the big deal with waiting 25 minutes for the next opening? Have we mentioned that we are a 43 foot boat with a FULL KEEL? Have you ever heard of WIND or CURRENT? When the wind or current, or even better both, are against your direction, Layla can point on a dime and we can provide the forward thrust to hold her steady in position until the bridge opens. When the wind or current, or even worse both, are with your direction, Layla floats her way closer and closer to the bridge with each passing moment. The only option we have is to turn her around and head in the other direction for a bit, before heading back 180 degrees to the bridge. This would not be such a big deal if it were not for the mega yachts lining both sides of the ICW. Not only does this decrease our possible turning radius, but it adds fodder to the pessimistic nightmare of gouging through the hull of one of these beasts and being beholden to them for the rest of our lives. So, you say, you understand the complexity, but why don’t we just cut our day short and limit our distance to just a few bridges each day. Surely this will decrease the stresses and anxiety. This would be a wonderful idea, but have we told you we have a 6.5 foot draft? Try finding anchorages along the ICW ‘concrete canal’ with at least 7 feet of water at mean low water. If you are not familiar with the depths surrounding the Florida ICW, let me inform you that there are very few. And so, we hope you appreciate that on one day, starting early in the morning from the north end of Lake Worth to a tiny cutout of the ICW called Lettuce Lake, we successfully passaged through 15 drawbridges, anchoring in 7 feet of water at mean low water just before sunset. We passed by and rejected three possible anchorages before deciding on Lettuce Lake. Our last bridge, the Las Olas Bridge, on our treck to Fort Lauderdale. This was the 26th bridge we passed through over 3 days. The next day we were on the home stretch, with only 4 bridges and 8 statute miles to reach our next final destination, Fort Lauderdale. We did not expect to stay long here in Fort Lauderdale, but Sailorman, the Super West Marine, Boat Owners Warehouse, and McDonald Hardware have kept us preoccupied. Not to worry; Layla is in good working order. However, there are always things to improve. Sailorman, the "Worlds Largest and Most Unique New and Used Marine Emporium". 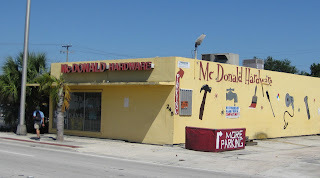 McDonald Hardware, our favorite hardware store so far. BOW, Boat Owners Warehouse, typically beats West Marine prices. We have really enjoyed our time in Fort Lauderdale. Unlike Vero Beach, Fort Lauderdale is alive with a heartbeat. We have crossed paths with travelers from France, Italy, and England while eating breakfast at a sidewalk cafe. We participated in the local “Amazing Race”, buying a t-shirt from one of the teams, as we took the trolley back from one of our many trips to the marine surplus stores. And we actually spent a couple of hours at the beach last Sunday, along with the flood of ‘Spring Breakers’, working on evening out our farmers tans. We have also had time to work on a couple of boat projects as well. For those that are interested, we’ll fill you in on some of the challenges in our next blog. For now, here are some pictures from our stay in Fort Lauderdale. 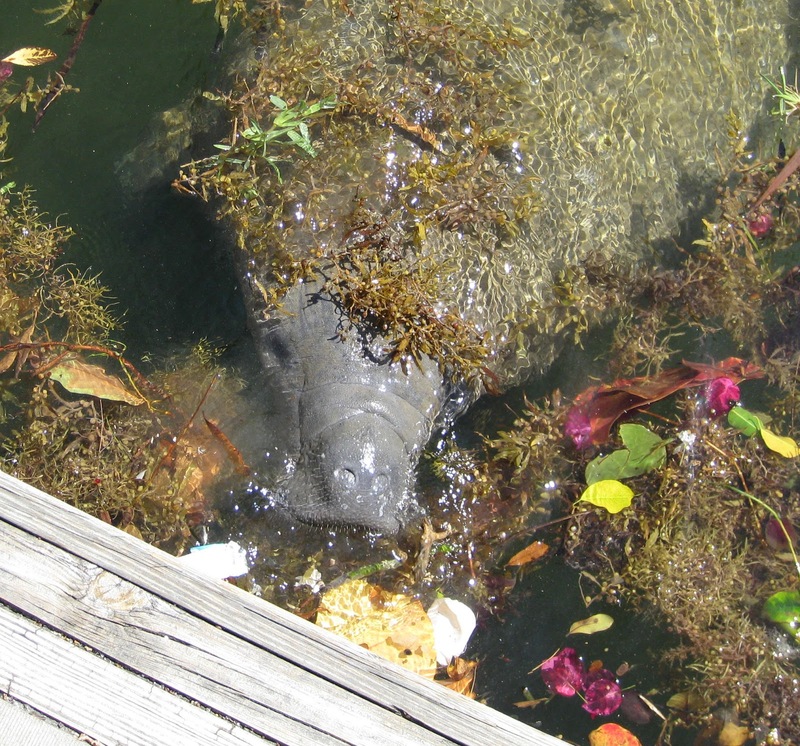 Bud watching a manatee munching at the dinghy dock at the Las Olas Municipal Marina. Layla on a mooring ball. Our home for our stay in Fort Lauderdale. A front passing through the area. The Fort Lauderdale Amazing Race teams on the trolley, racing to their next clue. A horse cop ticketing speeders on Seabreeze Boulevard. Two adventurers playing with their water jet packs outside the Bahia Mar marina. Tai Chi lessons on the beach. Bud waiting for the trolley to do some shopping. A heron making itself at home on one of the boats docked in the marina. The past week and a half has been time well spent in Fort Lauderdale, although we are ready to move on. 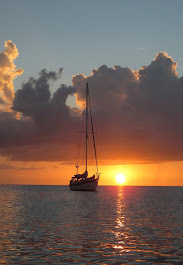 Miami is our next stopping point; about a day’s sail from Fort Lauderdale. We will not be following the ICW, as there is one fixed bridge with 56 foot clearance along the way, which is just two feet shy of our mast height. We are looking forward to the diversion, and actually getting our hands wet with some sailing. We will keep you posted when we get there.